Following on from the helicopter training this time last year, Hamnet Eastern Cape have been asked to assist once again. 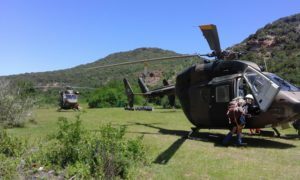 This will be the second time the exercise is being held and will once again take the form of a mountain rescue exercise in the Groendal wilderness area just outside Port Elizabeth. Hamnet will be providing portable repeaters and radio comms training to the mountain club rescue sticks. As such, each radio operator will be a fundamental member of the rescue party. Fortunately, one way or another, several of our Hamnet members are quite at home in the mountains. The exercise will take place on Saturday 5 and Sunday 6 November 2016. Contact Andrew Gray for more details. A JOC will be setup and hamnet members will accompany MCSA members on various tactical exercises. Air support from the Airforce will add excitement. Currently on the list to assist are: Andrew Gray ZS2G, Gert ZS2GS, Colin ZR2CRS and Dave ZS2DH. We will be camping over in the wilderness area on Saturday night. Hamnet members to please bring their own equipment (including camp gear to overnight) and please take note of the safety equipment required: Safety glasses, ear plugs, a harness and a helmet. This entry was posted in Eastern Cape by Dave Higgs. Bookmark the permalink.